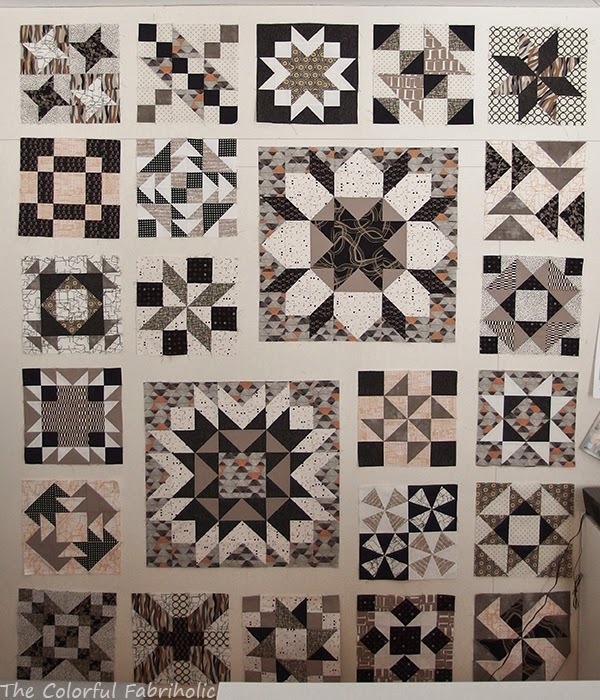 Now that all the blocks are complete for Gramercy & Friends, I've laid them out on the design wall. I've been moving the blocks around. What do you think of this layout? I'm trying to avoid having the same fabric in two blocks next to each other. I'm also trying for balance in value placement - some of the blocks "read" lighter and some read darker or bolder, so I'm spreading them around so they don't look too heavy all in one area. Also, there are several blocks with orange or gold in the light background fabrics, and I'm trying to spread those around, too. Hmm, looking at this photo, maybe I should switch the bottom right block and the one above it. Sorry for the badly lit photo - I can't back up any farther from my design wall. This layout stretches from the ceiling to about 8" up from the floor, and it's always dark down near the floor. Plus the cutting table is in the way, you can see part of it at the bottom. This week I hope to get the sashing done and maybe get the flimsy together. If I can do that, I can count the fabrics out in February! No fabric in and 2 yards out this week. The fabric swap that my guild was planning for the 17th was cancelled due to weather and rescheduled for the 24th. I have a grocery sack two-thirds full of fabrics to destash, but I won't count it out until it's gone. The two yards out are for damaged pieces I found when going through my stash that were thrown away. 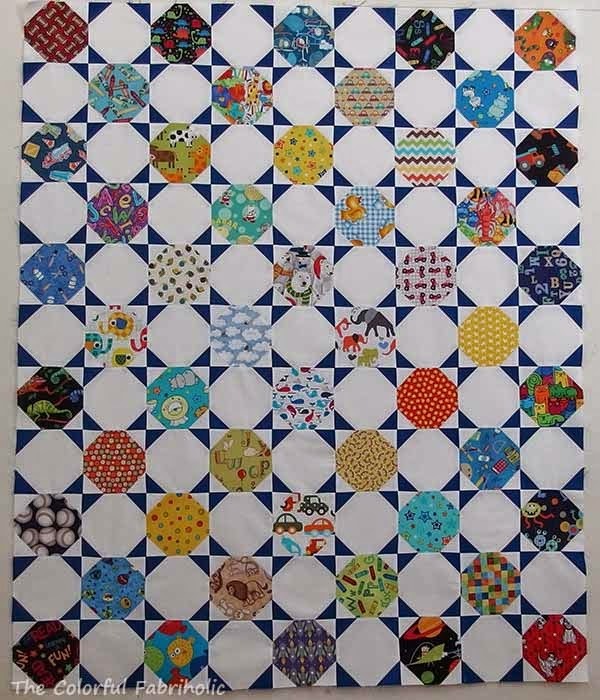 I had inherited some quilting cottons from my MIL and she hadn't sewn for at least five years before she died in '08, so there were some aged scraps that had become faded in places, etc. Also, some of her fabrics smelled like turpentine and had what appeared to be oily stains and discolorations along the fold lines. I definitely don't want these to contaminate my good fabrics so it's best to get rid of them. Out they went. I'll total up the ins and outs for the month next week. I have a lot to unload at the fabric swap, and I hope I don't bring too much home. I will say, though, that someone else's discards could be my inspiration. Three of the fabrics in my Plus Dash top were acquired at last year's fabric swap, the turquoise at upper right, yellow at left, and coral at bottom center. The yellow print actually inspired the palette. 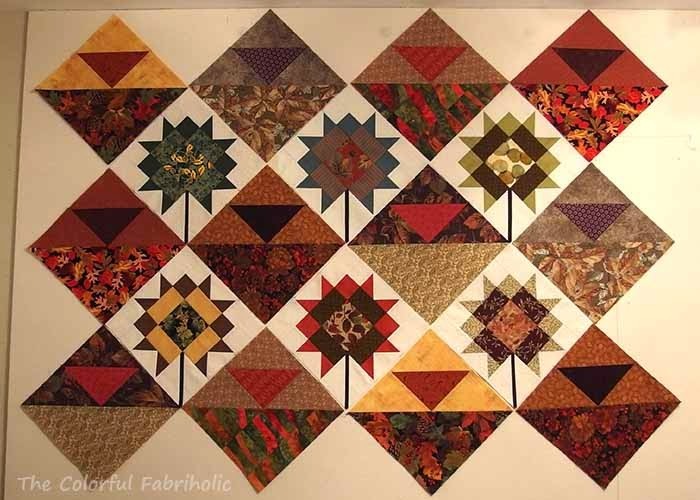 Linking up with Judy at Patchwork Times. Check out everyone else's stash management efforts over there. Spent part of today bonding with my seam ripper. Satisfied with the results. ... and start on the Swoon block. These will be used in this layout. Quilt Camp was so much fun! First, pillowcases. Eight pillowcases for kids, ready to donate to a local hospital. Our Sew Bee It bee is making them because one of our members has a son who benefitted from a similar donation and he - we - want to pay it forward. They especially need ones for older boys so I found some prints in my stash that would work, plus I used other juvenile prints that I had. That primary stripe was left over from the border of a baby quilt I made for a nephew who is now driving. I guess it's about time I put that fabric to good use! Because we spent so much time chit-chatting, watching videos, etc. I needed some mindless sewing, so I pieced a donation quilt top. This uses part of a fat quarter pack of batik dots that I picked up in Paducah a few many years ago. It, too has aged enough. I cut all eight colors into pieces and I'm making two kid quilts, one in boy colors and one in girl colors. I got the boy colorway done to a flimsy. These are actual hand-stamped batiks, and you can see where the chops were placed. This top finishes at 41" x 45". 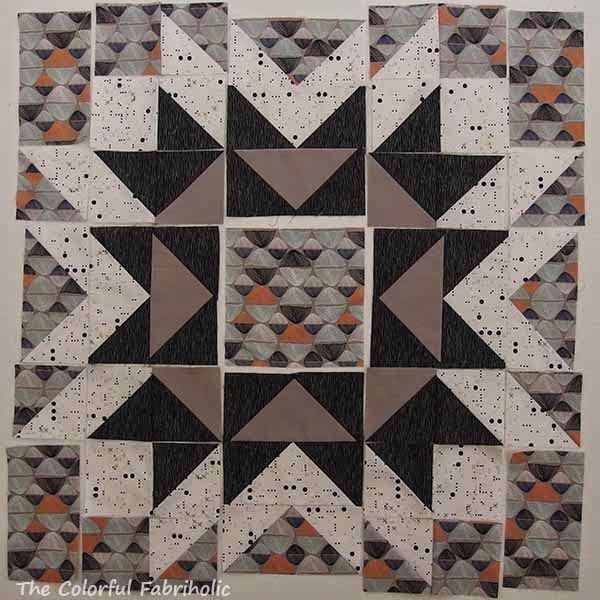 You may remember that I've been working on blocks using the Gramercy fabric collection and other coordinating fabric friends. I had kitted up two 24" blocks to complete the set. 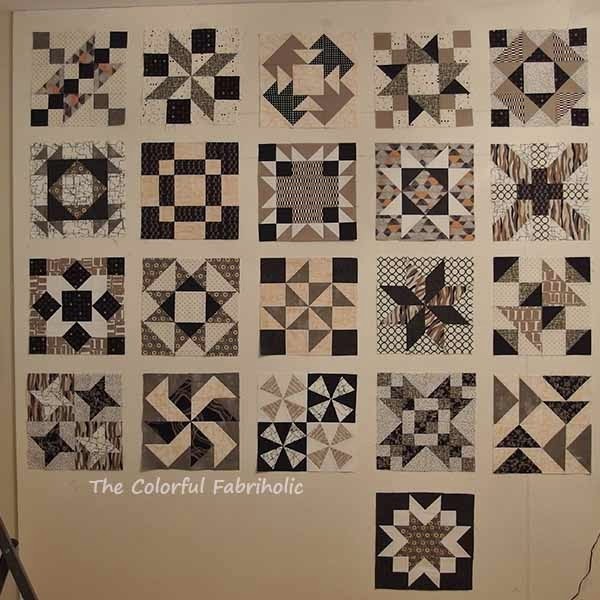 I was able to get one of the big blocks partially pieced and correctly laid out. Here it is on my design wall at home this morning, so I can continue to work on it. 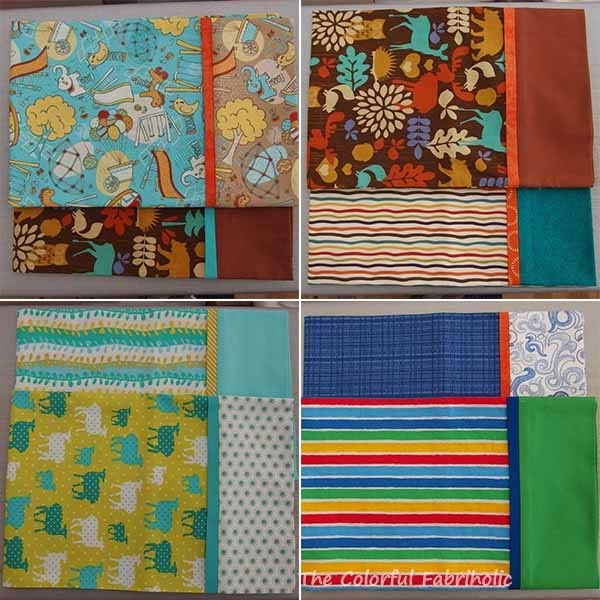 I was kind of afraid to work on these big blocks at camp (the other one is a Swoon block). For one thing, a lot of concentration is required to get the fabric placement right. Some of my prints are directional and that requires particular attention to how the pieces are cut, sewn, and laid out. For another thing, all the 12" blocks were pieced on my Bernina, and I'm confident of my seam allowance on that machine. For camp, I used my new little travel machine, which is A) new and unfamiliar, and B) has a different alignment for the 1/4" quilting seam which may be a thread or so wider than what I typically get on my Bernina. But since I was making Flying Geese using the four-at-a-time method and HSTs using triangle paper, it worked out OK so far. I left camp Saturday morning to go to the STLMQG meeting and stopped at a LQS that had a sale on the way back, and picked up the sashing fabric for Gramercy & Friends. 15% off of LQS price is pretty good. 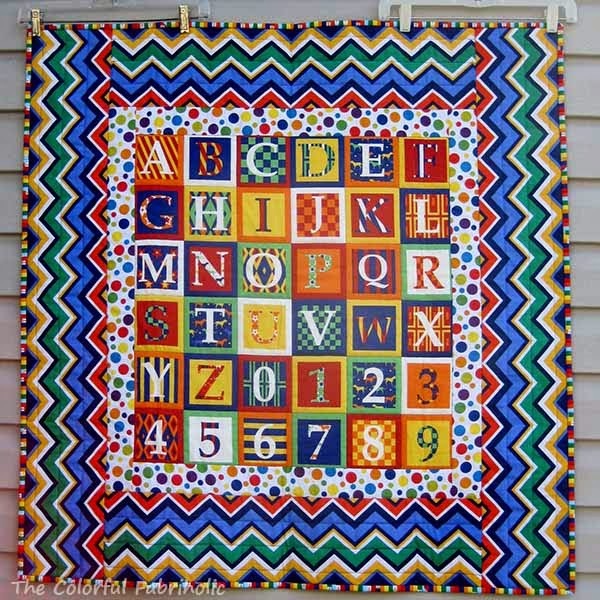 I had previously taken the blocks in and auditioned sashing fabrics, so I was glad to get the one I liked on sale. I'll count the batik dot flimsy yardage next week and tally up the totals at the end of the month. Tomorrow is the fabric swap at my other guild, and I have a bag of pieces that I'm destashing. I hope to restrain myself and not bring home much! 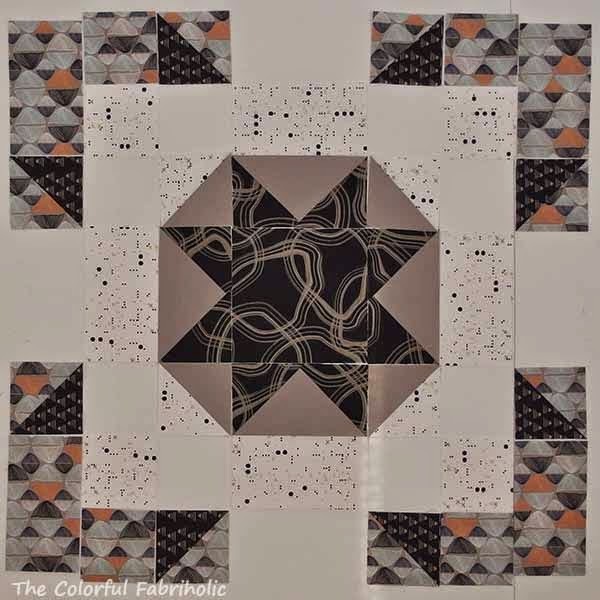 Linking up with Judy at Patchwork Times - check out everyone's design walls over there. Now that grandson Cannon has arrived, I can reveal the baby quilts I made for him. 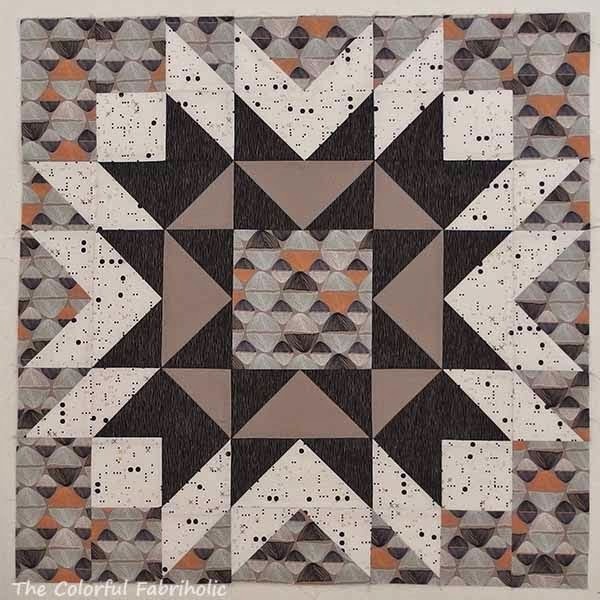 Yes, quilts plural. My son and his wife are separated but amicable and they plan to share custody as much as possible, so Cannon needs one quilt for at mom's and one for at dad's. Above is the one for mom. she likes bright, primary colors, not pastels. 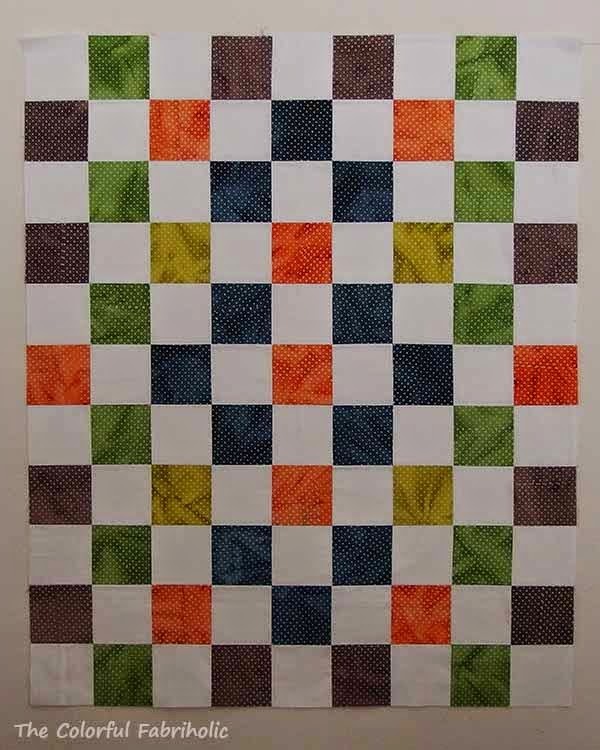 This is a simple panel with simple straight line quilting. The back is blue/multi polka dot flannel, soft and cuddly. And below is the top of the one for dad. I can't believe I didn't get a photo of the finished quilt!! 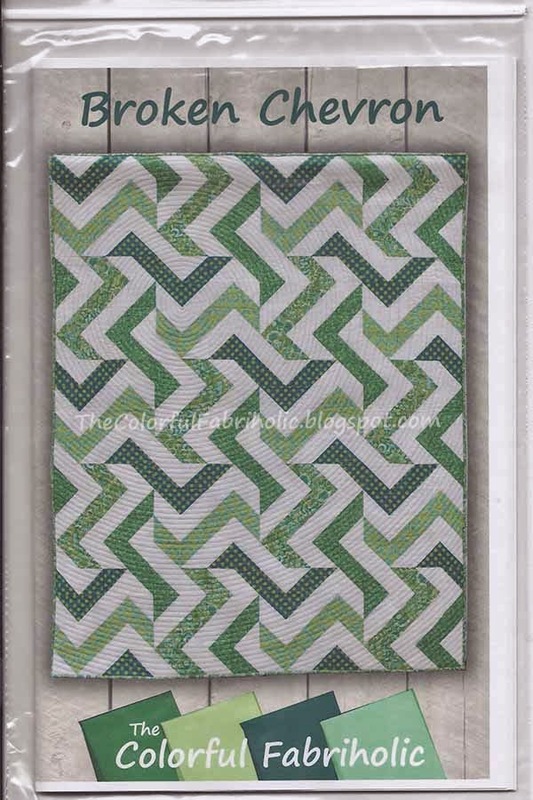 It's my own Charmed Snowballs pattern (see tutorial tab above) and it's like an I Spy quilt, no two prints repeated. The back, binding, and label are exactly the same as the quilt above for at mom's. 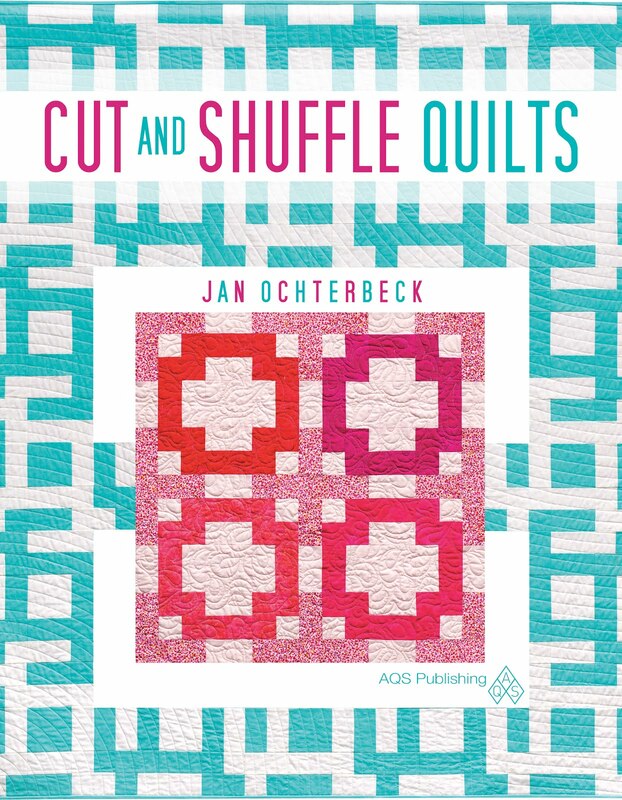 Joanne at Quilts by Joanne tested my Plus Dash pattern - and made some terrific suggestions for improvements, thank you Joanne! - and here is her finished version, which she named "ChurnPlus:"
I think it turned out terrific! She's donating it to Project Linus. My own Plus Dash is still just a flimsy, but I have an appointment to take it to the long-armer next week, so there's hope it'll be quilted soon. Pattern to be published soon, too. Thank you, Joanne, for pattern testing for me. This is what my design wall looks like today. 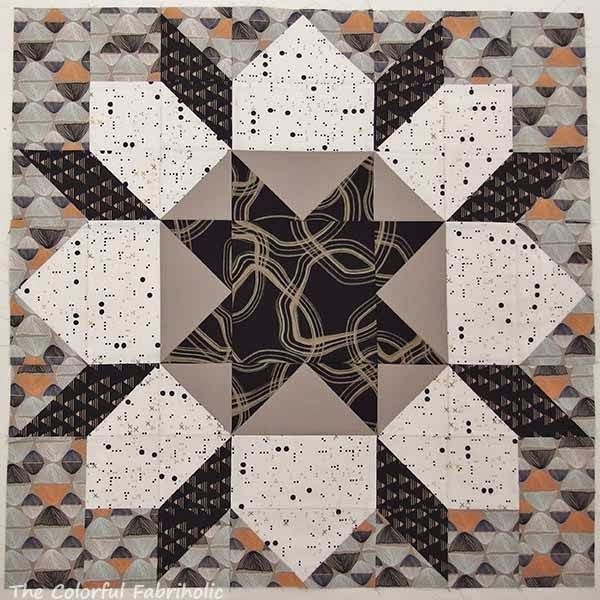 I'm linking up with Judy at Patchwork Times for Design Wall Monday. These are the first six months of First Saturday blocks from a LQS BOM program. Each month there is a main block and two alternate blocks. My plan was to sew the February blocks yesterday so they could be added to the mix. That didn't happen. Saturday at dinner we got the call, she's in labor. They live a little over two hours from here. Her due date wasn't until the 23rd, but we were told to expect the baby a bit early, like maybe next week. So we hurriedly got our act together and made arrangements for care of the dog. We drove to Columbia and arrived at the hospital around 10:00, to find that they were prepping for a C-section. 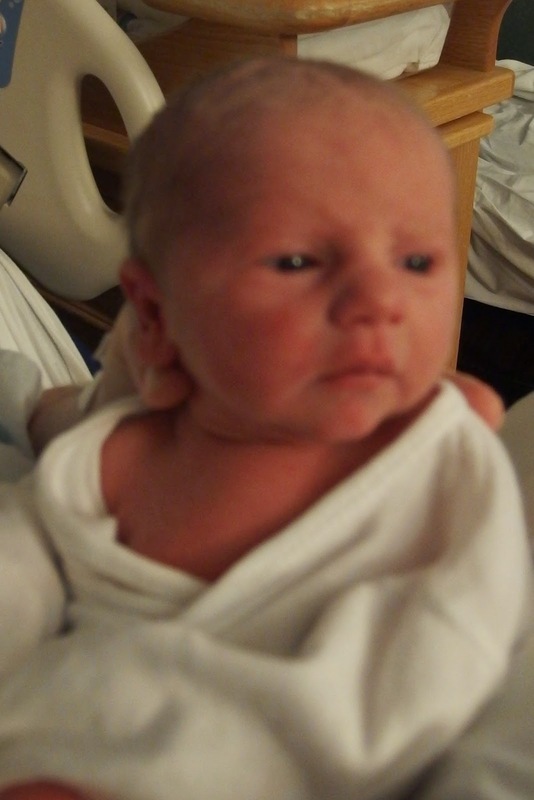 So baby grandson came into the world at 10:22pm on Feb 7, at 5 lbs. 14.9 oz. and 19" long. For the blog I will refer to him by his initials, CJ. We got to see the baby in the nursery immediately after his birth Saturday night, and we were able to visit again yesterday morning. Due to unfortunate circumstances, my son and his wife are separated, but amicable. I was afraid she wouldn't want us around. But she was very gracious. 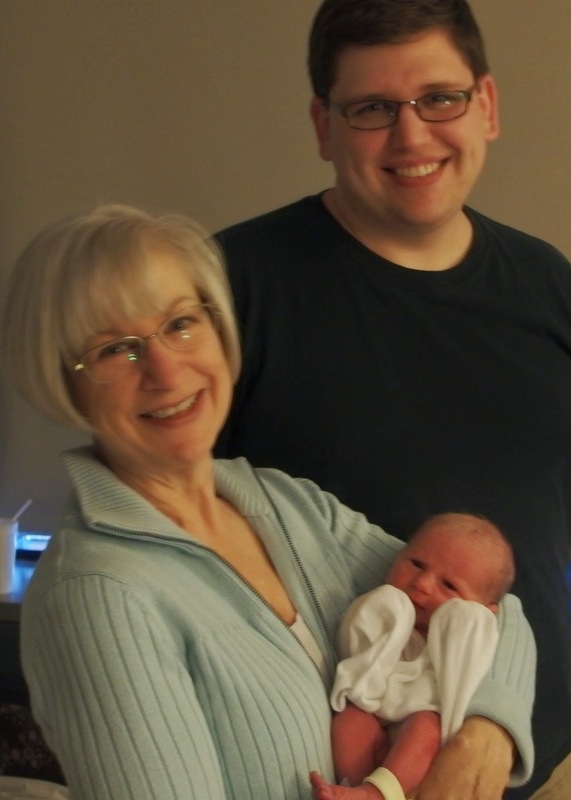 She didn't mind us in the hospital room with her and the baby, and when I asked her if I could touch him, she gave him to me to hold. Best outcome I could have hoped for!!! So needless to say, the February First Saturday blocks didn't get sewn yesterday, so they haven't been added to the design wall. I think I have a pretty good excuse, though, right?!!! PS - Stash report: No fabric in or out last week. What you can't see is the rest of the mess, nicely cropped out of the photo. On tap for this week, some serious cleaning up in there. The dust bunnies and clutter are taking over. 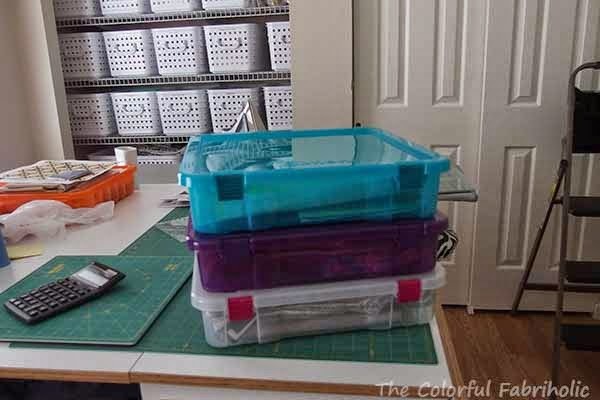 My sewing room is usually pretty serene looking (some would say sparse) and when it gets to this point where there's too much stuff piled up everywhere, it becomes stressful rather than enjoyable to work in there. So, time for a thorough cleaning. 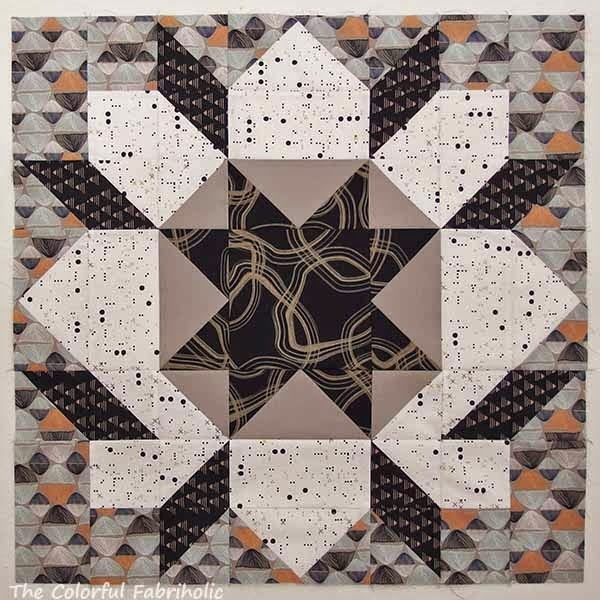 Linking up with Judy at Patchwork Times - check out everyone else's much-more-inspiring sewing rooms and design walls over there. Yards OUT - 0. Nothing I can count, nothing finished enough. I did make 23 12" blocks but since the flimsy isn't finished I can't count the fabric yet. YTD Net change - 19.75 yds in. Because most of this was sale fabric and very good prices, I ended up spending on average less than $4.00 a yard for what I bought in January. So, it was well worth the hit to my stash report to score these bargains. Now I just have to get busy and use up some yardage! 1. 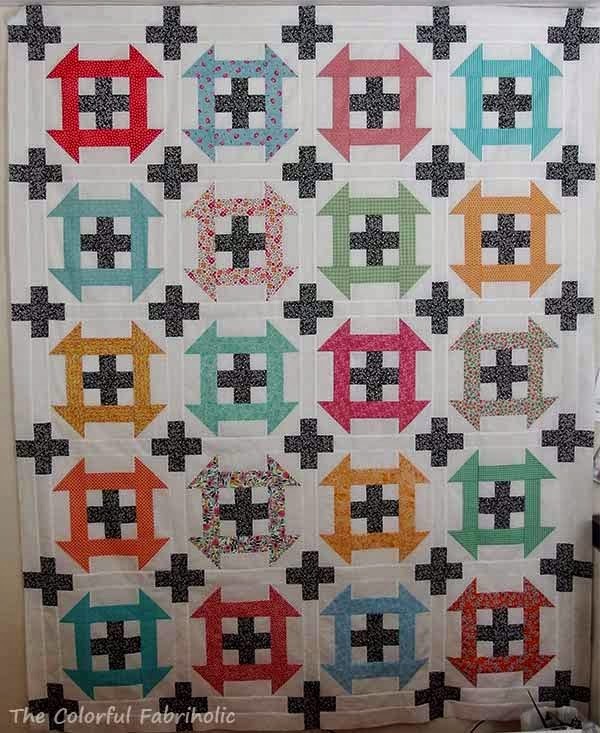 Add borders to CSQ raffle quilt. DONE & delivered to Sandy for quilting. 3. Piece backing for Plus Dash top. Found wide white-on-white backing in stash, will use that instead of pieced backing. Plus Dash is on Sandy's wait list. 4. Work on project for potential publication. 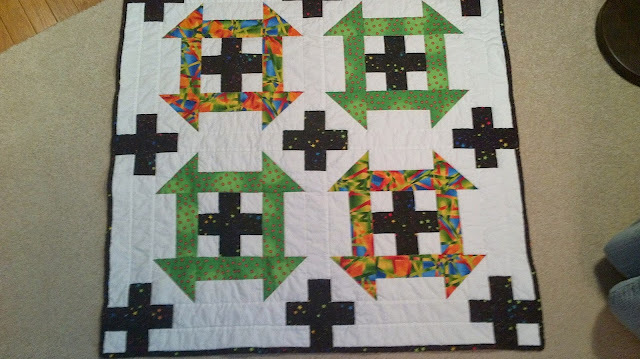 Completed ripping & re-piecing; worked on blocks; determined layout. 6. Prep projects to work on at camp retreat in Feb. DONE. Have 8 pillowcases kitted, two large blocks for Gramercy & Friends kitted, and "potential publication project" blocks to assemble into top. - Extra accomplished, not on original list: Made 23 different 12" blocks for "Gramercy & Friends." - Other extra accomplished: Made pincushion for STLMQG pincushion swap. I'd say January was a very productive month. February may be a little lighter; grandbaby is due this month. 2. Make 8 pillowcases at or before camp, to be given on 2/14 for delivery. With these goals - if I accomplish them - I'll have some good yardage-out numbers in February. I also need to get the label sewn on my Broken Chevron quilt and print some more patterns. 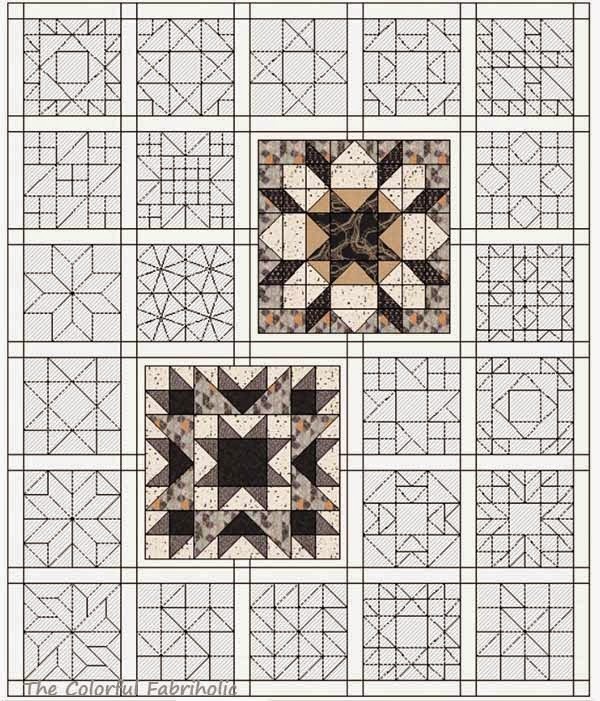 A local quilt shop is going to hang the quilt and sell my patterns. If you are interested in the Broken Chevron pattern, check out the Patterns tab above and e-mail me.